Three Little Birds is a song by Bob Marley & The Wailers, from their 1977 album, Exodus. Ian Brown covered this live at Glenrothes Hall, Scotland (13th February 2006) and the Koko Club, London (15th February 2006). 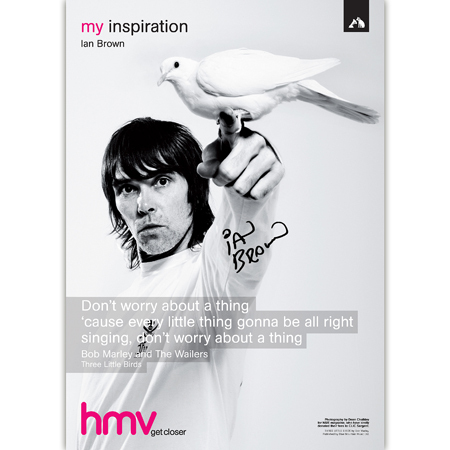 'My Inspiration' HMV poster. On this reggae theme, at 2005's Glastonbury Festival, Ian Brown could be heard singing the following lyrics from 'Live A Little Love' by Ini Kamoze: They say my heart, shares for too many / Hey, what do you say / They say my thoughts, worth no more than a penny / Hey, what do you say. This is sung A cappella, just prior to the performance of Time Is My Everything. Ian would later run through this Kamoze song during The Stone Roses' soundcheck at Les Nuits des Fourvières, Lyon (25th June 2012). On this reggae theme, Ian would sometimes walk on stage to 'Vice Versa Love' by Barrington Levy (see, for example, Amsterdam Paradiso in January 2010) and can be heard singing 'Black Roses' (a Levy song he would later put on record) in a 2017 Budokan soundcheck.